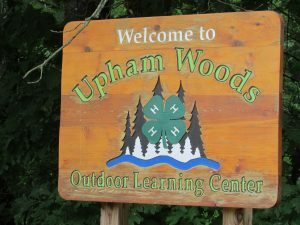 S’mores, campfires, tents, cabins, swimming, woods, canoeing, hikes, games, fishing, archery, crafts, we could go on and on about what you can experience when you join us for 4-H Summer Camp in Upham Woods. If this sounds like the kind of fun, exciting adventure that you want to be a part of then mark your calendar and plan to attend 4-H Camp on July 30 – August 1, 2019. We hope to see you there! Invite your friends – you don’t have to be in 4-H to attend summer camp at Upham Woods! All campers, 4-H and non 4-H, will need to fill out a 4-H Summer Camper Registration Form 2019 and return it to the Extension Office by Wednesday, June 5, 2019. If summer camp is one of your favorite 4-H memories, apply to be a 4-H Camp Counselor! Share your experiences with a group of young campers as you lead them on a nature hike, go swimming, or just hang out in the cabin. You will have an opportunity to help plan the 2019 summer camp and learn about your role as a camp counselor when you attend the counselor training. Don’t delay, apply today! Fill out the 2019 4-H Camp Counselor Application and return to the Extension Richland County Office. Applications are due March 1, 2019. Adult volunteers are essential to 4-H summer camp. If you are interested in being an adult volunteer at summer camp, we have just the right opportunity for you! Contact the Extension Office if you are interested at 608-647-6148. Chaperone: Sleeps in cabin with campers, counselors and other adults. Also assist with camp activities during the day. Craft Coordinator: Assists in the development and supervision of craft activities. Camp Nurse (CPR and First Aid certified): In charge of all camp related health and wellness concerns and medicine disbursements. Stays in nurse’s cabin during camp. Photographer: Take pictures during camp. Send digital pictures to the Crawford, Richland, and Vernon County Extension Offices. Dining Hall Coordinator: Is in charge of meal procedures during camp including supervision of set up and clean-up for meals. Archery Instructor: Provides introductory instruction for campers.